The Little Anne cpr training manikin is a realistic, inexpensive, lightweight, adult CPR trainer that offers all the essential features. It is designed with both the user and instructor in mind. The airway can be opened using head tilt/chin lift and/or jaw thrust techniques. Includes: Soft Pack/Training Mat Carry case, 2 Resusci manikin Faces, 2 Little Anne Airways, 6 Manikin Wipes, and Directions for Use. 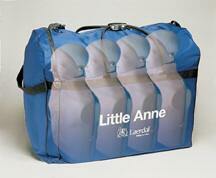 Click here for Little Anne Accessories: cpr airways - manikin faces - carry case. Four Pack Includes : 4 Manikins, Soft Pack Carry case, 8 Resusci manikin Faces, 8 Little Anne Airways, 24 Resusci Manikin Wipes, and Directions for Use. The Little Junior cpr training manikin has been developed to provide a low-cost alternative for effective child CPR training without compromising realism. Little Junior continues in the same tradition as the popular Little Anne and Baby Anne mannequins.The airway can be opened using head tilt/chin lift and/or jaw thrust techniques. Four Pack includes: 4 Manikins, Soft Pack carry case, 8 Junior Faces, 8 Junior Airways, 24 Manikin Wipes, and Directions for Use. 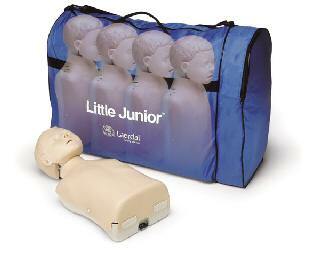 Click here for Little Junior Accessories: cpr airways - manikin faces - carry case. Single pack includes: 1 Manikin,1 Soft Pack/Training Mat carry case, 2 Faces, 2 Airways, 6 Manikin Wipes, and Directions for Use. 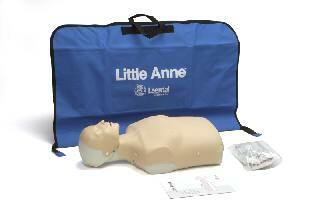 The Baby Anne cpr training manikin meets your need for a low-cost, lifelike infant CPR trainer. 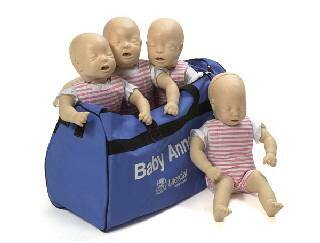 This package of four Baby Anne manikins makes hands-on practice affordable for every student. Four Pack includes: 4 Manikins, Soft Pack carry case, 24 Airways, 40 Foreign Body Practice Objects, and Directions for Use. Click here for Baby Anne Accessories: cpr airways - manikin faces - carry case. 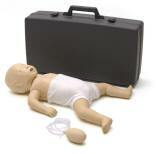 A low-cost, lifelike infant CPR trainer. It is the perfect supplement to the Resusci Baby manikin. Single Pack includes: 1 Manikin, Soft Pack carry case, 6 Airways, 10 Foreign Body Practice Objects, and Directions for Use. The most realistic and convenient infant CPR training manikin available. Includes: A plastic Carrying Case, 3 Resusci Baby Faces, 6 Resusci Baby Airways, 6 mannequin Wipes, Pulse Bulb, Tubing, and Directions for Use. 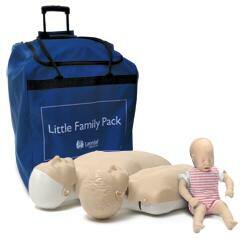 Now Laerdal brings you realistic, affordable quality CPR training in one "Little" happy family package - the new Little Family Pack. Designed to reflect the realistic anatomical differences among an adults, a child and an infant. The new Family Pack comes complete with one Little Anne, one Little Junior, and one Baby Ann, all in their individual cases. It's functional realism with all the essential features! Your students will benefit from the most realistic, age-specific manikins on the market today. And you'll benefit form the convenience. Little Anne Manikin includes: (1) Manikin, (1) Soft Pack Training Mat, (2) Resusci Manikin Faces, (2) Little Anne Airways, (6) Manikin Wipes and Directions for Use. 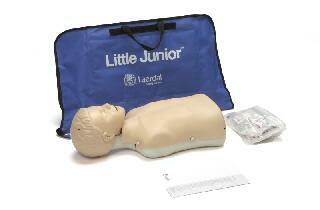 Little Junior Manikin includes: (1) Manikin, (1) Soft Pack Training Mat, (2) Faces, (2) Airways, (6) Manikin Wipes and Directions for Use. Baby Anne includes: (1) Manikin, (1) Soft Pack, (6) Airways, (10) Foreign Body Practice Objects and Directions for Use. Disposable plastic face shield with a low resistance filter that fits over the cpr manikin face. 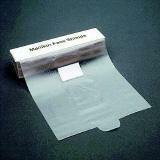 Used in addition to disinfection it offers an inexpensive extra barrier protection for students sharing a cpr manikin. purchase 6 at only $15.99 each! CPR Practi-Shields are ideal for CPR and AED training, offering cost effective barrier protection for students sharing a manikin. Individually folded and packed in a dispenser box. Latex free. For training only. Packed 50 per box.